HUGHENDEN: HOLIDAY ACCOMMODATION, ATTRACTIONS, RESTAURANTS, TOURS & TRANSPORT! East of Richmond lies the town of Hughenden, famous for the discovery in nearby Muttaburra of the first entire dinosaur skeleton ever found in Australia. 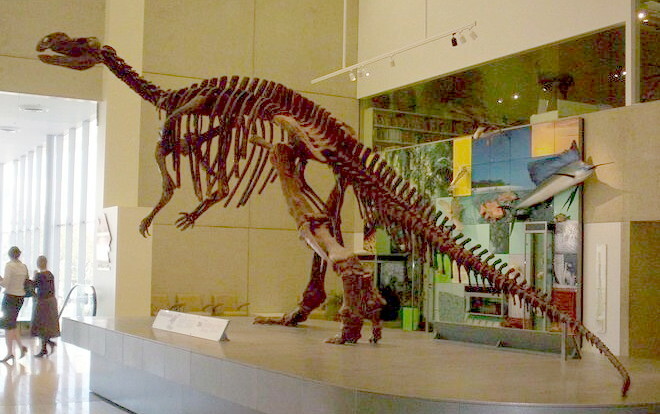 The original skeleton is now on display in the Brisbane museum, but a 14 metre replica of the MUTTABURRASAURUS, known as "Hughie", is the centrepiece of the Dinosaur Centre in Hughenden. White settlement in the area began in 1864, and in those early pioneering days, Hughenden was home (albeit briefly) to a well known character named HARRY MORANT. But 1905 was the turning point in the history of the town: the railway arrived, ensuring the continuing prosperity of the area. Today the town is a service and administrative centre for the surrounding Flinders Shire, which is one of the largest shires in Queensland. In fact, at over 41,000 square kilometres, the Flinders Shire is larger than the Netherlands, but has a population of less than two thousand people! The area around Hughenden is volcanic basalt country, rich in gemfields and littered with fossils and dinosaur remains. Visitors can fossick for gems, and fossils can be found in many of the creek beds surrounding the town. If you enjoy four-wheel driving, here you will be taken aback by the panoramic views and lookouts and the diverse range of flora, fauna, rocks and soils. Hughenden is surrounded by four National Parks, including the dramatic Porcupine Gorge, known as the 'little Grand Canyon'. This park hosts the annual 'Porcupine Gorge Challenge', and eight kilometre cross-country foot race which is accompanied by a suitable amount of fun and festivities. Open daily from 9:00am to 5:00pm everyday except Christmas Day and New Year's Day. The Flinders Discovery Centre and Dinosaur Display is home to the Muttaburrasaurus Langdoni. It was discovered in 1963 by a local farmer while mustering, and at the time was the most complete dinosaur fossil ever found in Australia. The fossil remains had been scattered about by the feet of cattle for years and some of the locals had even taken some pieces home with them. But when the importance of the find was made public, the locals returned their souvenirs, and most of the fossil was recovered. You will see the Coolabah Tree, also known as the Walker/Landsborough tree, as you head to the Hughenden Showgrounds. Of great historical importance, the tree is connected to the two parties that took off searching for the Burke and Will Expedition, the Walker and Landsborough ones. Both parties blazed the tree as they passed through this area and the spot is nowadays marked by two commemorative plaques erected near the tree as a tribute to them. Moorrinya National Park was initially establised as a sheep grazing property called Shirley Station. Later on, in the 1970's, sheep was replaced by cattle and it continued until the park was established in 1993. The park protects 18 different land types, with dry, flat plains criss-crossed by watercourses and covered in open eucalypt, paperbark and acacia woodlands and grasslands. Moorrinya National Park is also a wildlife refuge, protecting many Australian icons such as dingoes, kangaroos, koalas as well as other endangered species. For more information about this park, please CLICK HERE. Located about 45 kilometres north of Hugenden, Porcupine Gorge National Park covers an area of 5410 hectares, extending for more than 25 kilometres along Porcupine Creek. The park offers some very interesting sights, such as the Pyramid, an isolated monolith of multicoloured sandstone rising from the floor of the gorge, and the canyon the creek has carved. The park is also good for bushwalking, with some trails very well signed, as well as for wildlife viewing and birdwatching. For more information about this park, please CLICK HERE. 80 kilometres west-east of Hughenden it lies White Mountains National Park, covering an area of 108,000 hectares. The park offers spectaular white sandstone bluffs and gorges and many diverse plants and animals. Although the park features an arid landscape for most of the year, when the wet season comes the park is completely transformed when streams run full again thanks to the rain. Protecting a total of 14 different ecosystems, the park is fantastic for bushwalking, birdwatching or just to enjoy a picnic. For more information about this park, please CLICK HERE. The biannual event is held to celebrate the community within the Flinders Shire using the basis of the Dinosaur History. Everybody in the family will find something to entertain themselves during these four days of fun: a beer fest, a street party and a float parade and last, but not least, an evening full food and entertainment by the Flinders River. Celebrations for the Australia Day will start at 8:00am at the Diggers Entertainment Centre. A free barbecue breakfast will be provided for the early risers. And during the day, there will be the presentation of the Australia Day Awards. Trade exhibits, side show alley, horse events, dog shows, local arts and crafts, fireworks, dog shows, food, the Hughenden Agricultural Show has something for everyone to have a very exciting weekend. The Hughenden Rock and Roll Country Music and Dance Festival is held every year over the Easter break. It offers a whole weekend full of dancing, from competitions to dance displays and even a social dance. The whole program is available at the Diggers Entertainment Centre or the Flinders Discovery Centre. If you feel like helping others while still having a good time, join in the Hughenden Country Matrons Ball. Dine and dance the night away and do it happily, as the funds raised will go to the Royal Flying Doctors Service and other charities. The Porcupine Gorge Challenge if a must if you enjoy competing in one of the toughest races in the country. But this eight kilometre race is not only for finely tuned athletes. Aimed at the whole family, there will be junior tracks and participation walks so nobody feels left out. Part of the Fossil Trail Series that also takes place in Stamford and Prairie in the following weeks, the Fossil Trail Race in Hughenden will be a fantastic day of country racing and fun for everyone. The Hughenden Campdraft and Flinders Classic is the first campdraft of the year. The event, which includes horses and cattle, will also feature some of the best competitors from all over the country. One of the main events of this campdraft is the Flinders Classic, where all the contestants will compete to be the best in horsemanship and cattle skills. Hughenden holiday accommodation includes traditional pub style lodging, affordable motel accommodation and caravan parks, with a choice of cabins and units, as well as caravan sites and camping. Scroll down or use the buttons in the right hand column to choose your style of Hughenden accommodation. Featuring clean well appointed double and family rooms, Hughenden Rest Easi Motel is spacious and offers barbecue facilities as well as an inground pool. Located in the town centre, A Hughenden Wright's Motel offers its guests modern conveniences without losing its old charm. Featuring clean air conditioned cabins, single budget accommodation and grass camping area. The caravan park has a camp kitchen, laundry facilities and a heated swimming pool. Spacious motel with barbecue facilities and an inground pool, where campers and caravaners are welcome. The daily Greyhound bus service that runs from Tennant Creek in the Northern Territory through to Townsville passes through Mount Isa at 6:50am, stops at Hughenden at 12:10 every afternoon, and reaches Townsville at 7.00pm. The westbound service leaves Townsville daily at 7:00am and stops in Hughenden at 11.35am, continuing on to reach Mount Isa at 7:05pm. Queensland Rail covers the 1,000 kilometres between Townsville and Mount Isa, stopping at most points along the way, including Charters Towers, Richmond, Julia Creek and Cloncurry. The 'Inlander', as it is known, heads west from Townsville every Sunday and Thursday at 12:30pm, stopping in Hughenden at 8:19pm, and arriving in Mount Isa bright and early the next morning... 5:20am. The eastbound service departs Mount Isa at 1.30pm Mondays and Fridays, passes through Hughenden at 2:39am and rolls into Townsville at 10:10am the next day. For rail connections from Townsville, either north to Cairns, or south to Brisbane and beyond, you will find details on our GETTING TO CAIRNS page.